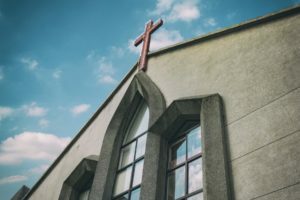 I once heard a friend ask, “Where is the Church in foster care and adoption?” She wondered how it was possible that her family felt so alone in it’s obedience to God’s call for them to foster hurting children. The children she, and many others are serving have faced unspeakable trauma, have lost the only moms and dads they’ve ever known, and often struggle to figure out which end is up. No one living out Christ’s calling to love his neighbor in this way should be left standing alone asking, where are all the Christians? Did you see it? God’s word tells us that we should live out our worship through the tangible acts of visiting orphans. Statistics tell us that only about 5% of the United States’ population will foster or adopt. That number isn’t much higher within the Church. And while we need many more Christian foster and adoptive homes, not every Christian should be a foster or adoptive parent. But every adoptive and foster family already engaged needs the body of Christ standing around them in this journey. Families who are engaging on the front lines of caring for children from hard places bear a heavy weight. It’s a load they carry with humility and joy knowing that this is cross-bearing love—partnering with the Great Redeemer who wants to see healing and restoration for these children. But it’s still a front-line, spiritual, emotional, and sometimes physical battle. And like any soldier, they shouldn’t be going into battle alone. 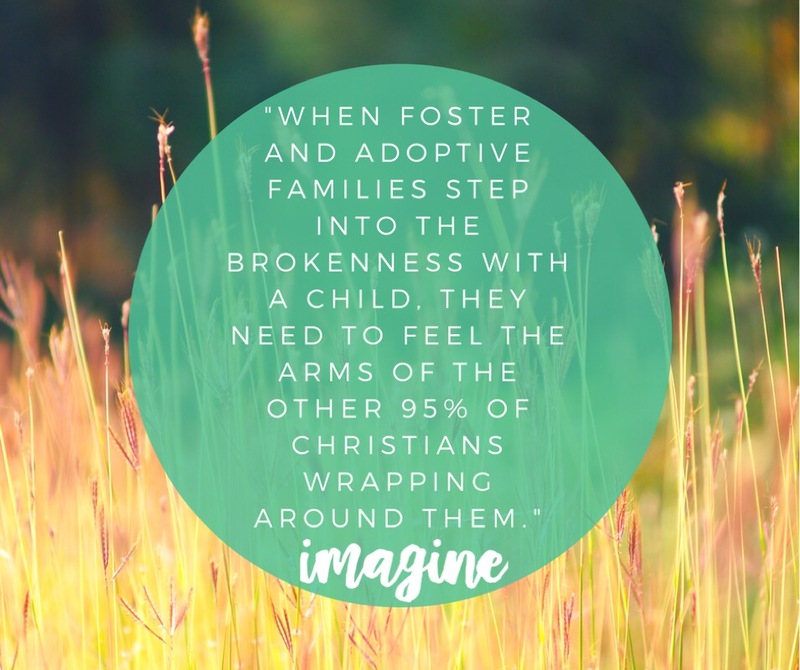 When foster and adoptive families step into the brokenness with a child, they need to feel the arms of the other 95% of Christians wrapping around them. So practically speaking, what does this mean to you? -Connect with a ministry that is offering adoptive and foster families free childcare. Childcare and respite is one of the most requested areas of help from foster and adoptive families. This could be as simple as serving with our OrphanCare Ministry that offers free respite nights for foster and adoptive parents 6 times a year. Get your clearances, and join us as we play kickball, do crafts, or rock babies. These moms and dads desperately need a breather to reconnect and invest in their marriage. -Sign up to be a Family Friend through the Safe Families for Children Program. This will allow you to be paired with a specific adoptive family so that you can offer ongoing respite. Just invite a child to join your family for a few hours a couple of times a month. It can make a world of difference to a mom or dad. 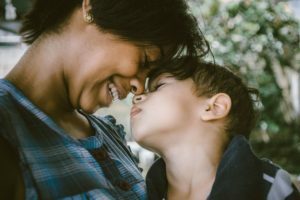 Parenting is hard, and parenting kids who have walked through trauma is quite different than parenting kids who have always known consistency, safety, love, and food. Your commitment to come alongside a family in a consistent way could bring unspeakable hope to them in the day-to-day. -Donate – Adoption is expensive, and foster parents are often met with unexpected and sometimes immediate needs. Organizations such as Foster Love Project or adoption funds through OrphanCare or Gregory’s Gift are meeting the tangible needs of Pittsburgh-area families. -Bring meals (and some for their freezer too!) Foster parents often accept children with very little notice. They have court hearings that don’t run on schedule, countless therapy appointments to help kids heal, and often are transporting the children in their home to visit with their biological families. Having someone they can call to bring a meal (even if it’s from a restaurant or frozen from a grocery store!) is a real blessing. -Mow the grass, do a load of laundry, etc. Adding a child to your family changes everything. Sometimes the list of every-day tasks that need to be completed is daunting while you’re in the middle of a period of adjustment. Pitch in everywhere you can. -Babysit. Foster and adoptive parents are required to attend extensive and ongoing training classes to prepare them for the realities of caring for children from hard places. They may have court hearings they need to attend, therapy appointments, and be transporting kids to visits with their mom and dad. If the family has other children in the home, they need you to show up in a big way so they can juggle it all. And quite frankly, they probably need a date night, too. Ask what clearances and training you may need, get them (it’s not hard), and then watch their kids. -Send an encouraging note and include a gift card to a local restaurant. Some days are just hard. Blessing a foster or adoptive family with a chance to eat out, or order in, and know they are being prayed for can be a bright spot in their week. -Celebrate them and their children (no matter how old the child is!) Imagine all the ways you’d be excited to welcome a baby into a friend’s family when she announces she is pregnant. Now do the same things for your foster and adoptive friends. I had another conversation with a friend recently who just started her fostering journey. She received her first placement, an infant, with little notice. The first night a friend dropped off a Pack ‘n Play, a bassinette, and other baby gear. Another friend asked if she needed infant clothes. 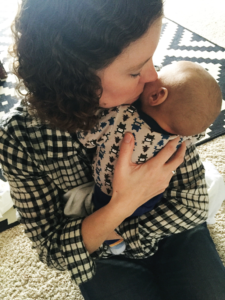 Another offered childcare for the children in their home while they were attending the court hearings for their foster baby, while another mom listened as she poured out her heart about the emotional rollercoaster of the first few days. Her response: it’s been amazing to see God meet our needs and feel the love of friends in this journey. Church, this is living out Christ’s call to love. Let’s make my last friend’s story a reality for every foster and adoptive family in our circle. May no one ever stand on the front line, answering Christ’s call, and say, “Where’s the Church?” Let’s live out our worship in these tangible ways.